Want to buy train tickets to St. Petersburg, Russia? If so, don't look any further. Here you can easily find and safely purchase online tickets on any trains from/to Russia. There are several reasons why some travelers, me included, prefer to get to St Petersburg by train. It is cheaper than taking the plane, comfortable, and more convenient and faster than the bus. Plus, everyone agrees that it is one of the most remarkable ways to experience the countryside of Russia. The most popular train routes for independent travelers are Helsinki to St. Petersburg, Moscow to St. Petersburg, and Tallinn to St. Petersburg, including of course the other way around. 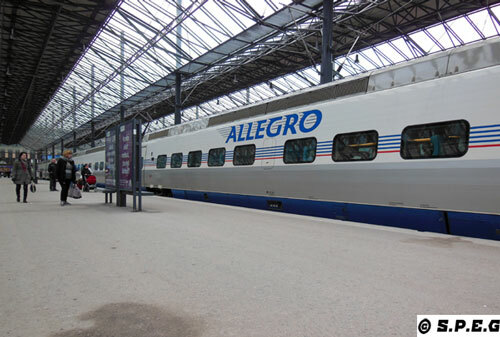 From Finland you can board on the new high speed train Allegro, and travel to Russia in comfort and faster without leaving your seat for customs/passport formalities as all border formalities are carried out on the train. From Estonia, you can take the train GoRail, the only operator of regular passenger services between Estonia and Russia. The trip takes 6 hours and the train now runs only twice per week. The route has previously been cancelled and re-introduced a number of times due to political reasons. If you're already in Russia, and you want to travel to St Petersburg from Moscow, or reverse, you can take the Sapsan high speed train on a daily basis, the most convenient way to travel between Moscow and St Petersburg, very popular among Russians and tourists. Ready to buy your train ticket? If so, start searching below, and enjoy your trip to Russia as you speed along the green pine forests. Use the widget below to search and buy your train ticket around Russia. Enter your details, and click search tickets. You will be re-directed to RussianTrain page, our partner. A reliable and easy booking system, with good after-sales service if you need it. This system is good for checking Russian train times, too, even if you plan to buy tickets at the ticket office. Try it! You can buy train tickets for Russia here and save money in five simple steps. Start searching using the train search engine above. From the drop down list menu, type your departure and return date and choose your arrival and return city, then simply hit the "Search tickets" button. After hitting the "Search tickets" button, a new page will load up with all the train options available. There you can still amend your travel date or time, plus choose in what currency to pay, which cabin to stay, and so forth. Once you're ready, just click on the icon "View seat" button of the train option that suits you best and select your seat. Then click on "Continue" the booking. After clicking on the button "Continue", another page will load up. There you will be required to fill out some personal information, such as passenger names, passports, birth dates and birth places, genders, and so on. To complete the booking, you will need to provide name and last name of the payer with a valid email address, and select the payment method. After filling out all this information hit the "Submit" button at the end of the page to make the purchase. Once seating has been assigned, you will get an email from RussianTrain with your boarding pass, an e-ticket with all the details of your booking. Make sure you print out the official boarding pass as you will need it to board the train. WHAT TICKETS CAN THIS SYSTEM SELL? This system can sell tickets for any mainline train journey within Russia, Ukraine, Latvia, Estonia, Belarus, Lithuania, Kazakhstan and the other ex-Soviet states. It will also sell tickets for journeys starting in those countries heading outwards, for example Moscow to Warsaw or St. Petersburg to Helsinki, or the other way around. Reservations officially open 45 days before departure, but Russian Train allow you to request tickets up to two years in advance and they will contact you for payment when the price is confirmed. CAN ANYONE BUY TRAIN TICKETS USING THIS SYSTEM? Yes, anyone can buy train tickets online with a credit card regardless of where they live: UK, USA, Canada, Australasia, Europe, China, or wherever. All major credit cards like Visa, Mastercard, and American Express, including the newer cards like Union Pay are accepted. When you buy train tickets through our third part system you are offered a number of delivery options, so you can choose the option that you suits you best. After booking online an e-ticket will be emailed to you within one business day for you to print out and show when boarding the train. If you travel in some areas where the e-tickets are not supported you'll need to collect your ticket later at the train station before boarding the train, or get it delivered to your home address. For your information, e-tickets are offered on all domestic routes within Russia, including major train connections between Russia and Europe, while paper tickets are offered only on some routes, such as all Asian trains, so China and some of the ex-Soviet countries. In this case tickets can be sent internationally to your home address or to the hotel you are staying at while traveling. Whatever is the case you'll know in advance what kind of tickets you're buying. So don't worry! WHO RUNS THIS SERVICE? IS IT RELIABLE? This service is provided by Russian Train, a reputable Russian company with offices in St. Petersburg. They have built the most comprehensive reservation system in the world for trains in Russia and Eurasia. The company has received very good reports from users around the world thanks to its prompt 24hrs customer service as well as its innovative online booking system, which contains tonnes of useful information and is connected to the official Russian railways so you can always see up-to-date schedules. IS IT CHEAPER TO BUY AT THE TICKET OFFICE? Russian Train charge the normal Russian Railways fare with a mark-up of 10% to cover their costs (usually all agencies charge a mark-up of 20%, but Russian Train do not). All costs are included in the ticket price you see on their website. No hidden fees or extra charges are added. Currently, there's also no charge for credit card payments, or if you use PayPal. By all means buy train tickets at the ticket office, if you're flexible, but Russian trains can get fully-booked so it's good to pre-book if you want a specific date and train. Russian Railways offer online booking and sometimes can be a little cheaper, but it's only in Russian language, so it can be worth the extra to quickly and simply organize your Russian rail tickets in English and online. If for any reason you don't want to buy Russian train tickets online, you can always buy them at the train station reservation office. ...Remember to take your passport, even if you only want a Russian domestic train ticket. ...Russian train reservations open 45 days before departure, you can't buy tickets before reservations open. ...Russian Railways have an efficient computerized reservation system, and you can book any journey within or out of Russia at the reservation office at any Russian railway station. ...To avoid language problems if you don't speak Russian, it's a good idea to learn the Russian alphabet so you can write down the journey and date you want to show to the ticket office staff. When writing dates, use roman numerals for the month. ...To know if there are any tickets available before you take the train, you can check how many berths in each class are still available on any train on any date within the next 45 days using the Russian Railways website, www.rzd.ru. However, the knowledge of Russian language is necessary in order to use the website, and probably the site won't accept credit cards issued in the USA. On Russian Railways website www.rzd.ru you can book domestic trains within Russia, and direct international trains too, including Paris-Moscow, Warsaw-Moscow, Vienna-Moscow and Prague-Moscow. You can also book intermediate journeys on the Russian-run trains, for example Paris to Berlin or Nice to Vienna on the Paris-Moscow and Nice-Moscow trains. The cheapest place to buy train tickets from/to Russia is at the station reservation office. Many main stations have a 'Servis Tsentr' (service center) where you pay a small fee (about 100rubles) to book your ticket in a relaxed air-conditioned environment. The extra 100rubles can be well worth it! You can also buy train tickets for Russia through several Russian agencies, but as I said earlier it will cost you more. Passport number is the most important thing and you are required to show your passport in order to board any train. When boarding passengers, train attendants will check passport numbers and names on the tickets against those in their passports. So don't misspell your name when filling out the booking form. Travel insurance is very important when travelling in Russia, also it will be required when applying for the Russian visa, so make sure you are covered. There is no need to worry overly about security on Russian trains, even for families or women travelling alone. How do you think Russian families or solo women travel? By train, of course, like everyone else! Just use common sense as you would in a hotel, locking your door at night and not leaving valuables unattended in your compartment. If you have more questions about the booking process above, or just want to learn more about it please read Russian train FAQ page. From Buy Train Tickets return to St Petersburg by Train or go back to the Homepage.